Increase your career rate of climb. This book includes pilot resumes, cover letters, interview preparation and much more. Addresses everyone from aspiring pilots to transitioning military aviators and old pros changing jobs or careers. 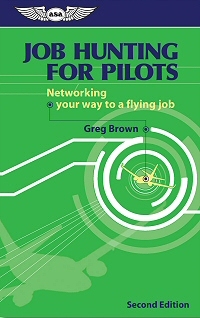 Shows how to develop those all-important inside contacts who can help you more quickly achieve your dream flying job. Join thousands of pilots who’ve advanced their careers with the aid of this unique book. Author Greg Brown’s love for flying is obvious to anyone who knows his column, “Flying Carpet,” in AOPA’s Flight Training magazine. Greg has been flying since 1971 and has found jobs as a pilot for both corporate and scheduled flight operations, and helped countless aviators achieve their career dreams through writing and seminars.